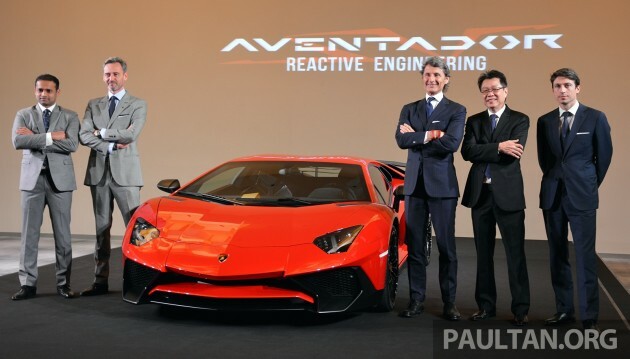 The Lamborghini Aventador LP750-4 Superveloce made its ASEAN debut in Singapore yesterday. Unveiling the latest raging bull was the president and CEO of Automobili Lamborghini himself, Stephan Winkelmann. Nearly but not quite an Asian debut, because the SV was revealed at the 2015 Shanghai Motor Show a day before. The range topping Aventador was first seen at last month’s Geneva Motor Show and this is the car’s fourth showing worldwide. It’s good enough to have more power, or less weight, but the Aventador LP750-4 SV benefits from both. Sant’Agata says that a focus on weight reduction while incorporating innovative technologies has resulted in the most sports-oriented, fastest and most emotional series production car the company has ever made. “In the Superveloce, Lamborghini’s expertise in lightweight engineering is clearly evident. With technological features which, combined with design, quality standards and craftsmanship, the Superveloce results in the most exclusive, pure and emotional production model in the history of our brand,” the sharp suited Winkelmann said. The weight reduction programme is powered by carbon. The Aventador’s carbon fibre monocoque with lightweight aluminum frames is fused with other CF components such as new door panels and new rockers and fenders in SMC superlight. Also in carbon are the new rear wing and the fixed air intakes. Inside, the new (thin and hard) sports bucket seats and full door panels are made of carbon and there’s no infotainment system in place, although owners can take up this no cost option. Also deleted are carpets and noise insulation material. Even the CF monocoque is now visible in certain areas such as the centre tunnel and sills. If you have a fetish for CF, the SV is sure to satisfy. All in, the gym-going Aventador is lighter by 50 kg to make 1,525 kg, distributed 43:57 front-rear. Behind the cockpit lies a revised version of the Aventador’s 6.5 litre naturally aspirated V12. A new lightweight exhaust system improves engine response and ups max power output to 750 hp at 8,400 rpm, a 50 hp boost. For stronger torque at high revs, both the V12’s variable valve timing and variable intake system have been optimised. Max torque remains at 690 Nm at 5,500 rpm, but max engine speed has been increased to 8,500 rpm. Combining lower weight with increased power, the SV’s power-to-weight ratio has been improved by 10% to 2.03 kg/hp. That’s good for 0 to 100 km/h in 2.8 seconds (0-200 km/h 8.6s) and a top speed of over 350 km/h. Yes, it may be just a tenth faster to 100, but at this level of performance, the margins are thin and every tenth counts. Equipped with carbon ceramic brakes, the SV stops from 100 km/h in just 30 metres. Lamborghini’s seven-speed ISR transmission is the motor’s partner in crime. The firm says that it’s the fastest automated manual gearbox in the world and it delivers an incomparably emotional gear shift. Plus a big kick to pin you back in the seat, as our track drive of the standard Aventador revealed. There’s a ‘4’ in the name, which denotes permanent all-wheel drive. A Haldex “Generation IV” electronically controlled coupling system does the torque shuffling, matching distribution to the dynamic situation in milliseconds. A self-locking differential at the rear axle and an electronic differential lock at the front controlled by the ESP further adds dynamic ability. As usual, three settings – Strada (road), Sport and Corsa (track) – alter the characteristics of the engine, transmission, differential, dampers and steering. Lambo’s pushrod suspension, introduced on the Aventador four years ago, incorporates adaptive Magneto Rheological Suspension on the SV. MRS individually adjusts wheel damping during cornering, suppresses body roll and also counteracts brake diving. Another big improvement is in the aerodynamics department. Overall aero has been optimised by 150% in efficiency and downforce is improved by 170% over the standard car. The most obvious element is the large rear wing, which can be manually adjusted to three positions. The front and rear ends are now more “open”, with the latter sporting a large diffuser and a sizeable mesh section for better heat dissipation. Four naked pipes complete the transformation. This unit’s Rosso Bia is the specially-developed launch colour, but Lamborghini’s Ad Personam personalisation programme offers virtually unlimited options if you think red is too mainstream. The Aventador LP750-4 Superveloce is limited to just 600 units worldwide, guaranteeing its value as a collectible from the start. It goes fast and is going fast – Winkelmann revealed that over 400 orders have been collected, and production will not be expanded to keep the car exclusive. Want? Lamborghini Kuala Lumpur has been allocated five units, and at the time of writing, four units have been accounted for. It is expected to cost RM2 million without duties (RM400k premium over the regular Aventador) and RM3.5 million with taxes, should you want to be the final member of this very exclusive club. Paying $1 million extra for carbon fibres here and there, and extra power you can’t use. Might as well get a second Lambo for that money. My Honda will tapao this gay with ease!!!! Yeah right..even if its true, your Honda won’t tapau lots of awek, amoi and minachi want to ride/sleep with this car owner..
People talk about acceleration, you talk about awek…tangan bebi masin? Dr Dog guranti lambo salesman kakakaka ..
Is Saga SV exclusive ah? Dei… SV Lambos double value ? At the rate they produce these SVs, that will be the first. Italian Lambos are no longer what they used to be… now brother VW only wants profit profit for a measly 50HP xtra. But extra 50 HP more than original Aventador LP700-4 doesn’t take such effects. You still have 0-100 less than 3 seconds and over 350 kph top speed, but its driving sensation is different, so superb. If you need exclusivity, you can bring this car home, but for everyday use, better take second hand Lambo. Nothing beats the last Murcielago SV. and I still think the Murcielago is the most beautiful Lamborghini ever. For me, its the most beautiful car in the world. This car doesn’t look like it will pass the pedestrian collision rating. And the amount of tax you pay itself can buy a BMW i8, which in my book is already a decent sports car, and the look is less ‘vulgar’ too. Those who wish to pay government more tax money please go and buy this. Pakai Aventador SV glamour, but pening kepala. Pakai Saga SV tak glamour langsung, but nothing to worry about. Wonder why those taking Br1m care to give comments here?? Pity them who don’t know Lambo. Like u said, why people who pays br1m cares to reply. I think the car is fantastic. Hope that they’ll give more units to be purchase in Malaysia. looks menacing..but i envy the murcielago lp670 sv more than this. anyway..good job lambo..still waiting for the proper road test report for this car..
Sure as hell I can’t afford this with my below average 3.5k salary. But I’m sure as hell will buy the 1:8 version from Pocher when it comes out! Gaaaaahhh!! Previous Post: DRIVEN: Nissan Teana 2.0XL – mid-spec, top choice?